Make it Happen marketing llc. > Business Development > It’s the Hard Way or the Easy Way! I love to read about business, marketing and entrepreneurial ventures. I guess I really like to see how people tick and in turn how they make their businesses successful OR not. Often I learn from watching others make mistakes. I guess I am a bit of a coward in that respect because I learned early that there are two ways to learn – the easy way or the hard way. The easy way is to learn from others mistakes — while the hard way is to be the “other” who makes the mistakes us easy learners learn from. With this in mind I was reading an interesting article from Inc.com that is a bit off the normal path of what I am drawn to. 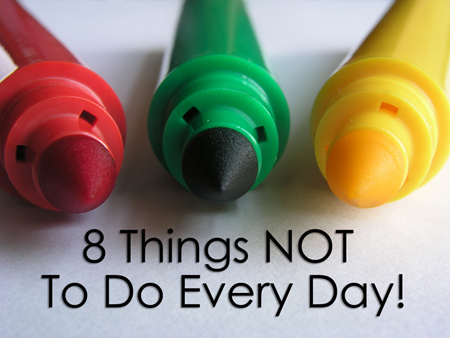 The title is, “8 Things You Should NOT Do Everyday” by Jeff Haden. I guess this title caught my eye because of the ‘should not do’ — rather than the TO DO’s we normally get in articles.